I am writing this post a few days before you will read it. Tonight I ran to Superstore for a few groceries (this would be similar to your Walmart Supercenters my American friends). The Christmas music was playing. Holiday decor was everywhere. And it smelled like Christmas. My nose lead me to the scented pine cones. I bought two bags and the smell followed me through out my shopping. I have found my Christmas spirit. Have you?! Vanity moment ~ Did you notice my new red manicure? Swoon! It is so delightful!! So those scented pine cones. I could smell them half way across the store when I got there. The supercenter sized store. I loaded them in my SUV and had to roll the windows down driving home (even though it was freezing). I started blowing my nose when I got home and ended up having to take allergy medicine! Woooweeee! I love scented things but these are off the Richter! They are in a bowl on our coffee table for now. I will have to see how we do with them. Maybe they will go in a basket on the front porch this year! Are you ready to get into the Christmas spirit? 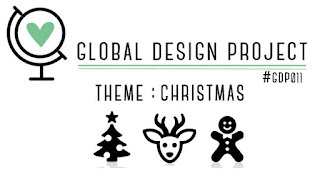 Create this week and share with the Global Design Team! Visit the Global Design Team's site for all the details!